Free Form™ AIR HT Product Information | Smooth-On, Inc. Specific Volume 54.31 cu. in./lb. Epoxy Laminating – Laminate Free Form™ AIR HT putty in between layers of EpoxAmite™ HT Laminating Epoxy and fiberglass cloth, carbon or other fiber for making lightweight composite parts. Eliminates the need to make multiple layers of laminating with liquid epoxy; saves time and labor. Used as a lightweight adhesive, Free Form™ AIR HT will bond to itself and a variety of surfaces including wood, stone and EpoxAcoat™ HT surface coat epoxy. Pot Life/Working Time – This material is mass sensitive. The more material you mix at one time, the less time you have to work with it. Working tip; If mixing a large quantity, flatten putty with a rolling pin to reduce mass concentration and extend pot life. Thickness; 1.5 inch (3.81 cm) – pot life is 90 minutes, handling time is 3 hours, full cure in 16 hours. Thickness; 3/8” (0.95 cm) – pot life is 2.5 hours, handling time is 5.5 hours, full cure in 16 hours. Thickness; 1/8” (0.32 cm) - pot life is 3 hours; handling time is 6.5 hours, full cure in 16 hours. Preparation – Materials should be stored and used at room temperature (73°F/23°C). This product has a limited shelf life and should be used as soon as possible. Mixing should be done in a well-ventilated area. Wear safety glasses, long sleeves and rubber gloves to minimize contamination risk. If making a 2 or more piece mother mold, apply appropriate shim apparatus to rubber mold exterior. Because no two applications are quite the same, a small test application to determine suitability for your project is recommended if performance of this material is in question. Free Form™ AIR HT putty comes as two parts. Dispense 2A:1B by weight or volume. These products have a limited shelf life and should be used as soon as possible. Knead parts together aggressively to a uniform color and apply quickly to surface of tool or mold. 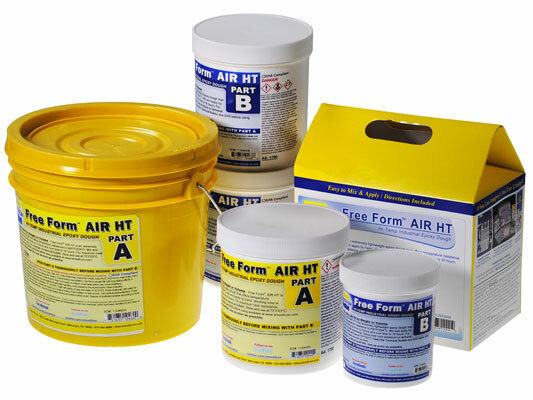 Applying – Mixed Free Form™ AIR HT is a dough that can be applied up to 1.5” (3.81 cm) thickness. Mix only enough material to be used at one time. Free Form™ AIR HT will bond to itself. Laminating - Free Form™ AIR HT can be used in conjunction with EpoxAcoat™ HT surface coat and EpoxAmite™ HT laminating resin to create a strong and lightweight composite tool or mold. Free Form™ AIR HT can also be used to stabilize tools during the heat post curing process to help reduce deformation. Post Curing For Maximum Heat Resistance - The tool should be allowed to cure at room temperature (73°F/23°C) for 16 hrs. At that point, preheat oven to 200°F and apply the following oven cure. Cycle should be 50 degrees per hour (tool temperature, not air temperature). 1 Hour at 200°F/93°C , 1 Hour at 250°F/121°C, 1 Hour at 300°F/149°C, 1 Hour at 350°F/ 177°C, 1 Hour at 400°F/204°C, then turn off oven and allow tool to cool to room temperature. This post cure schedule will result in a heat resistance of 400°F/204°C. Removing Uncured Free Form™ AIR HT Epoxy Putty - Remove as much uncured material from the surface as possible. Clean any residue with soap and water. Optional - Use E-POX-EE KLEENER™ available from Smooth-On.